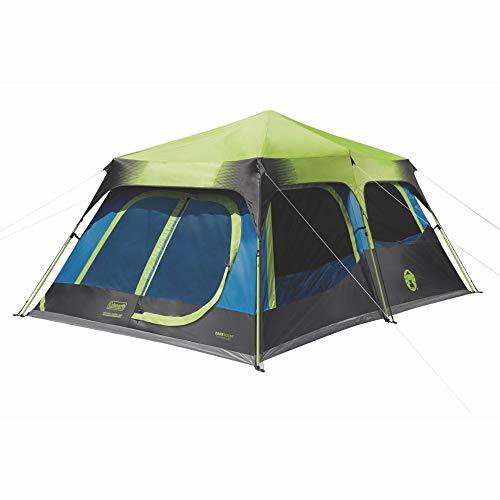 The Coleman 10-person dark room instant cabin tent with rainfly blocks 90% of sunlight so families can put the kids to bed early and festival goers can Sleep in past sunrise. Dark room technology also reduces temperatures in your tent, letting your group enjoy a comfortable night's Sleep. Every moment of your outdoor camping adventure is precious, so preassembled poles mean you can have your tent set up or taken down in about a minute. If it rains, this tent is guaranteed to keep you dry and comfortable thanks to an included rainfly and the weathertec system, which uses a tube-like floor with patented corner welds and protected seams to help keep water out. Rugged polyguard 2X double-thick fabric stands up to the rigors of the outdoors and will last season after season. Illumiline reflective guylines are more visible at night so you don't get Tripped up if you need to take a walk in the dark. INSIDE, the spacious cabin fits 4 queen-size airbeds and features a room divider for privacy without feeling cramped. When it's time to head home, the tent packs up into an included expandable carrying bag.